The Earth’s first 700 million years are referred to as the Hadean Eon. Before its orbital path was swept clean, the Earth was bombarded by rocks circulating through space. These impacts transferred a huge amount of kinetic energy to the young planet and this was transformed into thermal energy, to which was added more heat generated by radioactive decay of short-lifetime elements. The surface of the young Earth was so hot that rocks melted to magma. It was indeed like Hell, as the name Hadean suggests. The elements forming the Earth were produced in exploding stars. At first, these different sorts of matter were more or less homogeneously mixed, with one part of the Earth similar to another. Because elements like iron and nickel were denser than the others, they were attracted to each other by gravity, which eventually pulled them down through the Earth’s other matter, falling like sand through water and coalescing in the center of the new planet. Lighter material such as silicon remained closer to the surface. This process of differentiation occurred during several tens of millions of years. It left Earth with a hot iron-rich core, whose existence would be essential to its subsequent history. The temperature of the core is due not only to the tremendous pressure of the outer minerals but also to heat generated by radioactive decay of core isotopes. Volcanoes spewed lava, rocks and gases, thus establishing the early Earth’s atmosphere, with some gas perhaps arriving on rocks from space. Its composition is not known precisely, but it probably contained water, methane, ammonia, carbon dioxide, sulfur dioxide, hydrogen and nitrogen. Carbon dioxide was presnt in relatively large amounts, as on Mars and Venus. When it dissolved in the oceans, it combined with calcium to make calcium carbonate which precipitated out to form limestone, thereby reducing the quantity of CO2 in the atmosphere. [ref]MacDougal, (1998) 27. [/ref] It seems that there was no separate oxygen at all for about two billion years. The theory explains several observations. Aside from Earth’s iron and volatiles, it and the Moon have similar composition because Earth and Theia did, indicating that they were formed close to each other. Light, volatile elements like hydrogen nitrogen, carbon and sulfur, were dissipated by heat from the fragments which formed the Moon. The giant-impact hypothesis explains the similar ratios of oxygen isotopes on Earth and Moon. It also explains how the Moon’s rotation in its orbit, keeps the same side toward the Earth. The impact has also been evoked to explain the inclination of the Earth’s rotational axis relative to its orbital plane, caused when the impact tipped over the Earth’s axis. Originally, the Moon was much closer to the Earth than now. The Earth’s orbital rotation was much faster, so a day was only five hours long, but the Moon took 84 hours to go around the Earth. Gravitational tides resulting from the pull of the two bodies on each other deformed their surfaces, stirring them into oceans of magma. The process also brought about a slowing of the rotation of the Earth and an increase in distance between the two bodies. In this way, the Earth’s rotational angular momentum decreased as the Moon’s orbital angular momentum increased, thus conserving total angular momentum: Some of Earth’s angular momentum was effectively transferred to the Moon. Both ancient tidal sediments and coral layers indicate that an Earth day was significantly shorter hundreds of millions of years ago. Mirrors left on the Moon by astronauts have allowed the observation that the Moon still is slowly receding. The giant-impact hypothesis seems to offer the best explanation for the Moon’s formation, but study continues. After the Earth-Theia impact, the surface of the Earth again was molten. As it slowly cooled, crystals of olivine (magnesium silicate) formed. Being heavier than the surrounding magma, they sank into it and continued growing into larger crystals, eventually forming the green rock dunite. Then pyroxene, a chain silicate[ref]We will see what that means in the next paragraphs. [/ref], was formed and mixed with the olivine to form greenish-black peridotite, starting about 4.5 Gya and continuing for hundreds of millions of years. As the peridotite hardened, it formed the Earth’s first, temporary crust. But as it became denser, it cracked and broke and sank, pushing more magma to the surface to cool and continue the process as the mantle too slowly solidified. [ref]Details from Hazen, op. cit., chapter 3. [/ref] Magnesium-silicate peridotite came to constitute much of the Earth’s mantle. As peridotite was subjected to heat and pressure in the mantle, it began to melt. Not all of it melted at once, so the first fraction to melt had a different constitution and contained much less magnesium and more of other elements. The result was a lighter magma which in turn rose to the surface and accumulated in cracks and pockets and finally exited through volcanoes or rifts as basalt. Since basalt is lighter than the rest of the mantle, it piled up into volcanic mountains. Basalt exists in many different forms, but two minerals are essential: plagioclase feldspar and the same pyroxene that exists in peridotite. Although peridotite is still the principal component of the Earth’s upper mantle, it is rare on the surface of the Earth. Basalt has remained and continues to be produced, as in the following figure. The above figure, with its black basalt “sea” and volcanic cone of lighter rock (rhyolite), gives an idea of how Earth may once have looked. 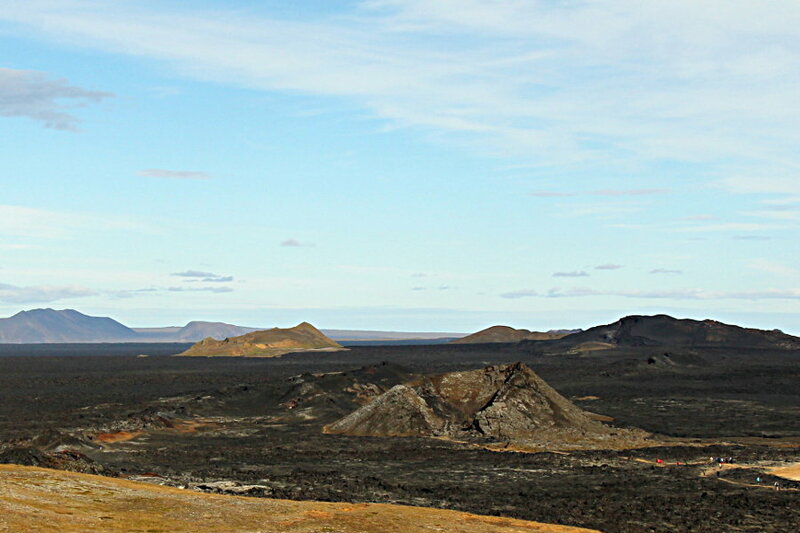 But this Icelandic landscape is the result of volcanic activity known as the “Krafla Fires” which occurred from 1975 to 1984. The Earth still has some seismic tricks in its mantle. 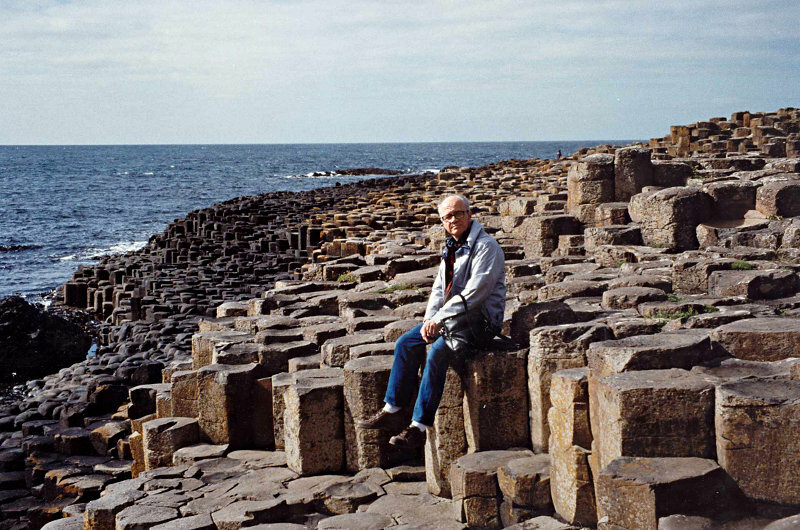 Basalt columns at Devil’s Causeway, North Ireland,. Photo by author’s wife. On cooling, thick basaltic lava flows may crack so as to form vertical columns, often hexagonal in cross section. Volcanoes had been spewing forth water vapor from the Earth’s interior for a long time before the Earth-Thea collision blew it all away. But afterwards, the process started over and soon there was liquid water on Earth. Zircon, or zirconium silicate, is an extremely hard mineral, resistant to alteration, and often is used as a gemstone. It can last for a very long time, it may contain uranium – which means it can be dated – and it contains oxygen. High proportions of the heavy-oxygen isotope, 18O, indicate that crystals were probably formed in water. Such is the case for the world’s oldest known zircon, dated to 4.4 Gya, which leads many scientists to consider that there was already water on the Earth at that time. Continents had not yet formed, but convection in the mantle gave rise to volcanic heat rising in certain places, called hot spots, which ejected heat and matter through volcanoes at the surface. Those convection currents were not circulating air, but circulating rock, and on a huge scale. The Earth of 4.4 Gya would have been covered with an ocean studded with such volcanic islands. Some disagree. Evidence of sediments from at least 4 Gya indicates clearly that large bodies of water existed by then. And it was water which brought about the next major step in differentiation of the Earth’s minerals. As contradictory as that may seem, basalt heated by underlying magma melts at a lower temperature when it is cooled by water. [ref]This is like salt melting ice on your driveway in the winter. [/ref] Just as the sinking of peridotite isolated basalt, so did melting basalt isolate silicon. Minerals with high silicon content were even lighter than basalt and so floated to the surface to form the first granite. Granite is composed of four constituents: quartz, two different feldspars and either pyroxene or mica. As more basalt sank into the mantle and more, lighter granite rose to the surface, the increasing amount of granite coalesced into large islands, perhaps sometimes fused together by heat from asteroid collisions, and grew into floating plates. Any remaining basalt was lower than the granite plates and so found itself on the floor of the ocean where it is predominantly found still today. By 3 Gya, plate tectonics had started. Settling of heavy iron to the core leaves lighter elements behind in the mantle. Melting magma forms olivine which forms dunite and sinks into the mantle. Remaining olivine combines with pyroxene to form peridotite, which forms the Earth’s first, temporary crust before it too cracks and sinks into the mantle. Melting peridotite combines with feldspar to produce basalt, which floats to the surface and forms the next layer of crust. Basalt is still being formed along, for instance, the mid-Atlantic ridge. Melting basalt sinks beneath silicon-rich granite, which floats on the basalt mantle. The crust is still formed of basalt at its lower levels, beneath the oceans, and granite higher up on the land. Earlier, the outer gas planets had their composition determined when solar wind blew the lighter gases outward from the inner rocky planets. And much later, continuing differentiation would separate molecules by forming cell membranes – leading to life. All these processes are examples of ordering driven by energy with much heat loss with an increase in total entropy. Because of the Earth’s continued volcanic activity, no rocks from the Earth’s beginnings exist. Radioactive dating of the oldest rocks gives an age greater than 3.8 Gy. [ref]The principal source for all these figures is an excellent review paper, “The scientific age of the Earth”, on-line at http://www.talkorigins.org/faqs/dalrymple/scientific_age_earth.html. Another excellent source is the US Geological Survey at http://pubs.usgs.gov/gip/geotime/age.html. [/ref] Zircon crystals from western Australia have been found with ages up to 4.4 Gy. The fact that all the planets and their moons not only follow their orbits but rotate in the same direction strongly suggests their all having the same origins. Meteorites which have been dated all were formed around 4.5 Gya. Meteorites called chondrites have the same chemical composition as the Sun and are formed of collections of grains which indicate they have never been melted. So they are considered to have the same composition as the Earth before differentiation. They should also be only slightly older than the Earth. Different methods of radioactive dating indicate that these meteorites are at least 4.6 Gy of age. Rocks brought back from NASA’s Apollo mission to the Moon have been dated to between 4.5 and 4.6 Gya. Now that geological hell on earth is over, on to the Archean Eon and the rise of life on Earth.